Feed additional grains, high energy fibres or oil where extra calories are required. Oats or Pryde’s Energy Pak (extruded corn), Power Pak (extruded barley), EasiFibre or EasiOil are ideal additions. Avoid feeding uncooked corn or barley. Adjust the amount fed so it is appropriate for a horse’s body fatness, growth rate, stage of development, pregnancy or lactation or stage of training and workload, along with the quality and quantity of forage available. The feeding rates given here are based on the amount of feed needed to meet a horse’s vitamin and mineral requirements. If you feed below these feeding rates, vitamin and mineral deficiencies will appear in the diet and may affect health and limit growth and sound development or reproduction. To avoid this, simply add one of Pryde’s EasiBalanced Pellets to top up vitamin and mineral intakes. 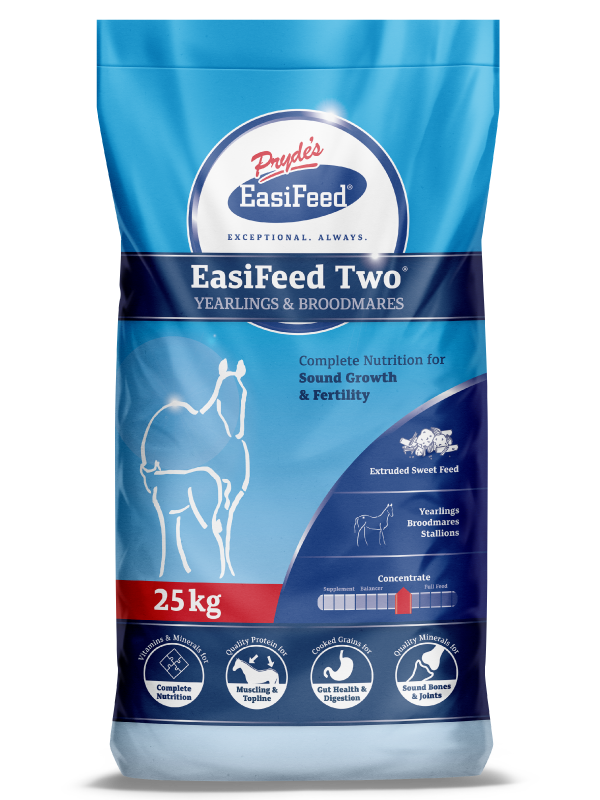 Note: Ingredients listed pertain to EasiFeed Two® for QLD, NSW, VIC, SA & NT. ** EasiFeed Two® for TAS, WA and Export (incl. NZ, Asia) contains Micronised Sunflowers instead of Whole Black Sunflower Seeds. Nutrient analyses & feeding rates are the same for both versions of EasiFeed Two®.